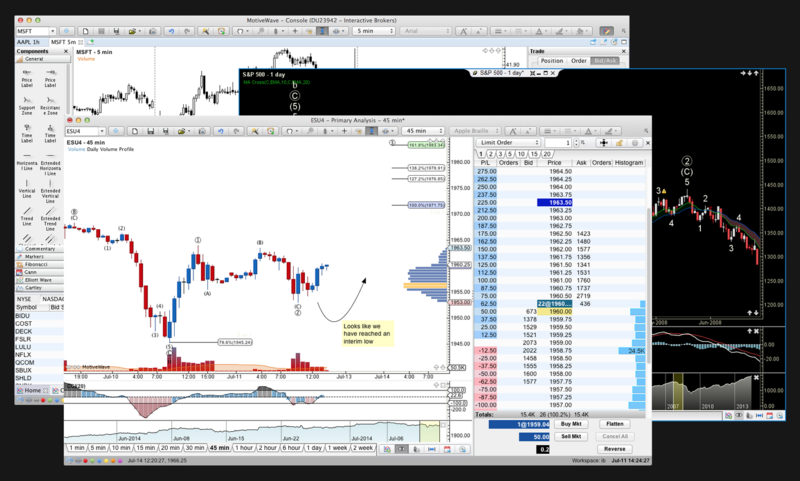 MotiveWave is a powerful Elliott Wave software that I use everyday to prepare and publish my Elliott Wave charts. MotiveWave is having a Spring Sale for 7 DAYS. Spring Sale will run from Tuesday, March 12th to Midnight EST on Monday, March 18th. MotiveWave is also an advanced professional trading platform. To see all of its features go here. 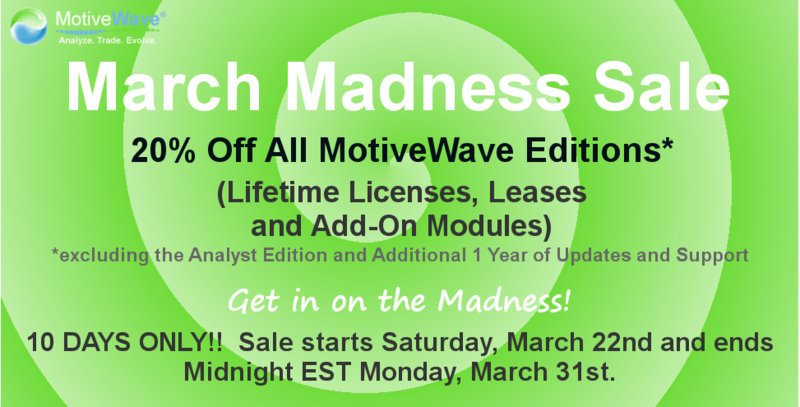 The Spring Sale discount is 20% off most MotiveWave Lifetime Licenses, Leases, Installment Plans and Add-On Modules (excluding the Charts Edition and Additional 1 Year of Updates and Support). You must have a free trial profile in MotiveWave’s system before you can purchase MotiveWave. To start your free trial go here. You will see the discount applied on the Order Summary page before you are asked to pay. If you do not see the discount applied on the Order Summary page before being asked to pay during the sale period, you should contact MotiveWave directly BEFORE the end of the sale and BEFORE purchasing. If you are on a lease or own a lower edition and want to upgrade to the lifetime license or a higher edition, please contact MotiveWave directly to find out what their specific cost would be for your upgrade. Spring sale is for 7 days only: from Tuesday, March 12th to Midnight EST on Monday, March 18th. Take advantage of this sale before it’s gone! This means 20% off Lifetime Licenses*, 20% off Leases, and 20% off Add-On Modules. This sale is for 8 days only! Sale ends Tuesday, July 31st, 2018 – at Midnight EST. Make sure you take advantage of this sale before it’s gone! * Excluding the Charts Edition and the Additional 1 Year of Updates and Support products. Note: The prices you will see on the MotiveWave website are regular prices, but you will see the special 20% off Summer Sale discount applied during the purchase process before you are asked to pay. If, for some reason, you do not see the discount on the checkout page, please contact MotiveWave before purchasing and before the end of the sale. 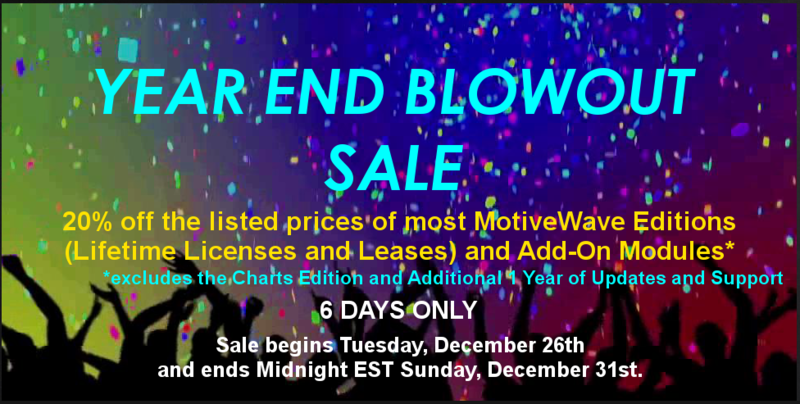 Back by popular demand: MotiveWave Year End Blowout Sale! So many asked for it again, that MotiveWave has decided to have one again this year! MotiveWave’s Year End Blowout Sale is on now and only goes until Sunday, December 31st, 2017 at Midnight EST. You have 3 DAYS left to get in on this Year End Blowout Sale that cannot be extended past December 31st. This means 20% off Lifetime Licenses (excluding the Charts Edition, which remains regular price), 20% off Leases and 20% off Add-On Modules. A simple classic technical analysis pattern may answer the question of what direction to expect tomorrow from the S&P500 upon release of Non Farm Payroll data. This release is expected to move markets strongly:. Pennants are reliable continuation patterns. The pattern is supported if volume declines as the pattern forms. Pennants normally appear about halfway within a trend. 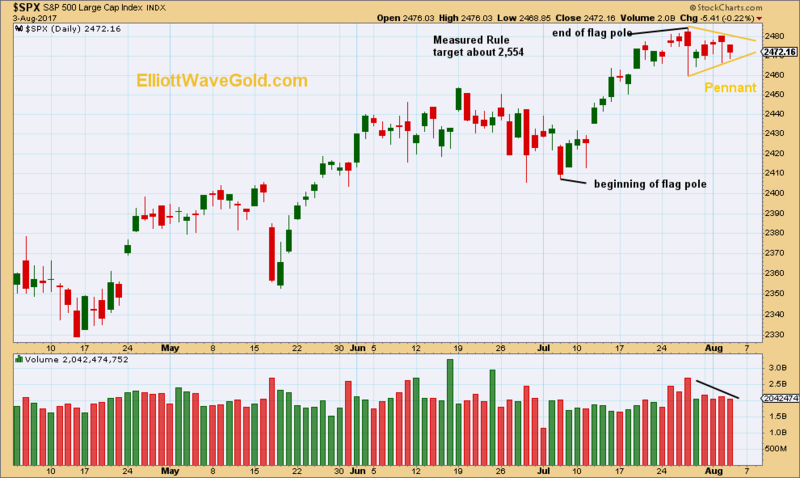 The measured rule takes the flag pole which precedes the pattern and adds that length to the expected breakout of the pattern. If this pattern is correct, then tomorrow may see an upwards breakout to new all time highs for the S&P500. Published @ 06:28 a.m. EST. This sale is for 7 days only! This special 20% off sale starts Tuesday, July 25th and ends Monday, July 31st at Midnight EST. Click here to get in on the Madness! Sale starts Tuesday, March 21st and ends Midnight EST Monday, March 27th. Sale starts Monday, March 21st and ends Midnight EST Monday, March 28th. On Balance Volume was originally developed by Joseph Granville in 1976. Today, it is considered the grandaddy of all volume indicators. Daily data is accumulated. If price closes higher, then volume for that day is added to the prior total. If price closes lower, volume for the day is subtracted from the prior total. If there is no change in the closing value of price, then OBV does not change. 1. Confirmation of a trend. If over several time periods OBV moves in the same direction as price, then this confirms a trend. If over several time periods OBV does not move in the same direction as price, then the trend is weak and expect a reversal. 2. Divergence. Between highs and lows, if price makes a new extreme and OBV does not, then it indicates weakness in the direction of price, so expect a reversal. 3. Trend lines. It is my experience that this is the best use of OBV. When price is consolidating OBV will find support and resistance at trend lines. OBV is a leading indicator. If it breaks support or resistance, then the direction of the break from OBV is often a warning that price will break out of a consolidation zone in the same direction. The example from Gold below illustrates all three ideas. From July to October 2015, Gold consolidated in a wide price range delineated by the blue horizontal lines of resistance and support. What direction would the breakout be? The first indication was divergence between the price highs of 24th August and 15th October. While price made a new high OBV did not. This indicated weakness in upwards price movement. Divergence is indicated on price and OBV by green lines. 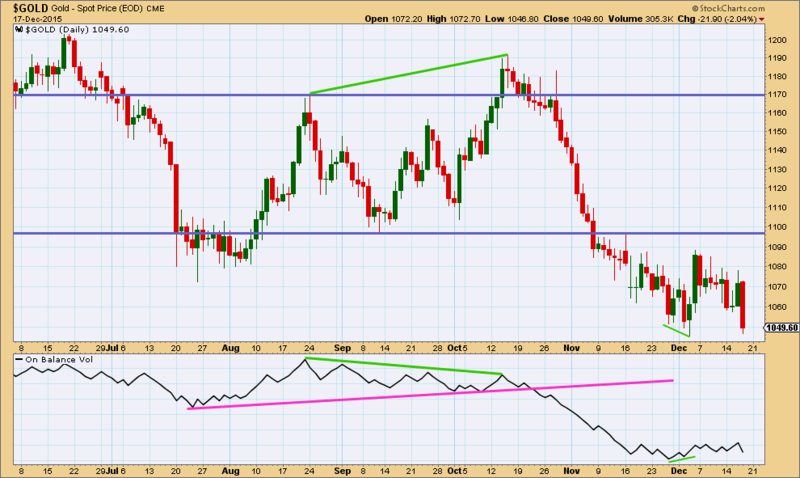 The final indication came when OBV broke below its pink trend line in 23rd October. Note that this break came prior to the strong downwards movement from price. OBV indicated that price was likely to break out downwards from the consolidation zone and that is what it did. As price fell strongly from 28th October to about 18th November, OBV also moved strongly lower confirming the price trend. At the end of the trend, OBV again diverged from price. The final low in price at 3rd December did not see a corresponding low from OBV, so this divergence indicated the downwards trend was weak and another consolidation should be expected. The flip side of the title to this post is “don’t trade against the trend”. The fact that markets trend is why traders make profits. Price is not completely random. Price tends to move in trends. Trends are often delineated by trend lines. When price is consolidating it tends to move in whipsaws about a moving average with choppy overlapping sideways movements. Price tends to move from resistance to support and back again, but not in a straight line. Overshoots of resistance and support can also happen yet price can turn back into the consolidation zone. It is impossible to tell exactly when and where price will turn, so if trying to trade a consolidating market losses are inevitable. Mean reverting systems for trading during a consolidating market are suited for the most experienced and nimble of traders only, not at all for beginners or those with only a few years experience. When price has been consolidating for a while, then horizontal lines can be drawn to show the upper and lower boundaries of the consolidation zone. It then becomes a waiting game. Waiting for a breakout. When price breaks above resistance or below support on a day with an increase in volume, then a breakout is indicated and the market has begun to trend again. When price is trending it moves in a clear direction, usually finding support (an upwards trend) or resistance (a downwards trend) at a sloping trend line. The clear direction of price movement is what makes profit easier, so the trick is to identify a new trend early enough to allow for profit to be made and then to identify when it is over early enough to exit the trade with a profit. For less experienced traders, it is advised to wait for a clear trend to be evident and then to only trade in the direction of that trend. Profits should be relatively easy as long as the trend is not exhausted. If staying with the trend is the easiest way to make a profit, then it makes sense to avoid trading when the market is not trending. It is often the trades that a trader does NOT take which makes the difference between profit and loss. Cut losses by avoiding consolidating markets. If there is only one lesson that new traders can learn which will improve trading performance, it is to only trade a clear trend in the direction of that trend. MotiveWave is an incredibly feature-rich platform that works with multiple brokers and data services. 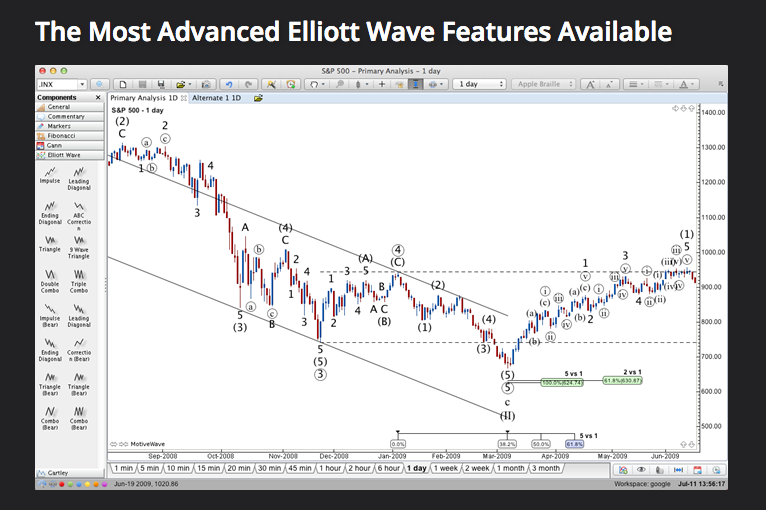 MotiveWave has the most advanced Elliott Wave Software and Elliott Wave Tools available. Elliott Wave Tools range from manual to semi-automatic to automatic Elliott Wave to suit your preference. Elliott Wave labels are always automatically added for you, cutting down your analysis time significantly. Manual Elliott Wave tools let you plot your own wave counts easily. Our Auto Elliott Wave tool will fill in Elliott Wave counts automatically on one chart based on a selected area of a chart. Our Auto Analyze Elliott Wave tool will automatically plot Elliott Waves over a specified range of data to a specified level of decomposition on one chart. The Elliott Wave Scanner (pattern recognition tool) allows you to search for specific Elliott Wave Patterns across multiple symbols/instruments based on options you choose. All wave counts can be moved or adjusted after being placed on the chart and can be decomposed as many levels as you want. Summer sale means 20% off Lifetime Licenses*, 20% off Leases, and 20% off Add-On Modules. This special 20% off hot days of summer sale starts Thursday, July 23rd and ends Thursday, July 30th at Midnight EST. * Excluding the Analyst Edition and the Additional 1 Year of Updates and Support products. ** The prices you see on the MotiveWave website are regular prices, but you will see the special 20% off Summer Sale discount applied during the purchase process before you are asked to pay. If, for some reason, you do not see the discount on the checkout page, please contact MotiveWave before purchasing and before the end of the sale. This special 20% off sale starts Wednesday, July 30th and ends Tuesday, August 5th at Midnight EST. Sale starts Saturday, March 22nd and ends Midnight EST Monday, March 31st. Click here for the lowest prices of the year! Sale starts 12am EST Friday, November 29th and runs until Midnight EST Monday, December 2nd. 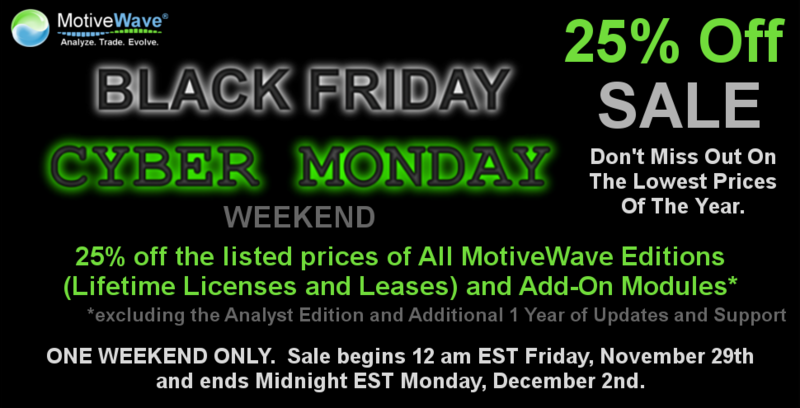 25% discount off all MotiveWave Lifetime Licenses, Leases and Modules (excluding the Analyst Edition and Additional 1 Year of Updates and Support).